Nervous Wreck forms zig-zags to induce membrane ridges and scallops. Merged LM/EM images of Drosophila S2 cells featuring Nwk F-BAR induced protrusions. Sorting and processing of the proteins that span cell membranes requires extensive membrane remodeling , including budding, tubulation, and fission. F-BAR domains form crescent-shaped dimers that bind to and deform membranes. 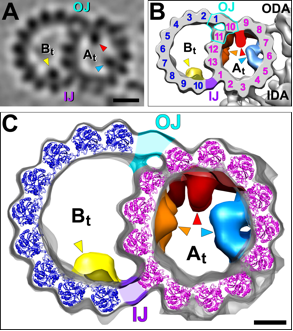 Until now, it was thought that proteins containing these F-BAR domains induced membrane tubulation by assembling in highly ordered helical coats on lipid bilayers. A new paper in Molecular Biology of the Cell from the Rodal lab (in collaboration with the Nicastro lab and the Sokolova Lab at Lomonosov Moscow State University) describes a novel membrane deforming activity for Nervous Wreck (Nwk), an F-BAR protein that regulates trafficking of transmembrane growth signal receptors at the Drosophila neuromuscular junction. The authors found that Nwk assembles into zig-zags on lipid monolayers, unlike the canonical F-BAR protein CIP4 which forms long filaments, even though the two proteins are predicted to be very structurally similar. Unlike other members of the F-BAR family that tubulate the membrane, Nwk can induce the formation of membrane ridges and scallops (see figure below). These deformations can lead to dramatic cellular remodeling in cooperation with the cytoskeleton (see figure above). The work done by the Rodal lab suggests that while basic self-assembly and membrane binding properties are likely conserved between F-BAR proteins, the higher-order organization of Nwk may account for differences in membrane remodeling and its specialized role in the cell. Eukaryotic cilia and flagella are highly conserved organelles present on the surfaces of many animal cells and protists. These organelles are important for cell motility and/or sensing of the environment. 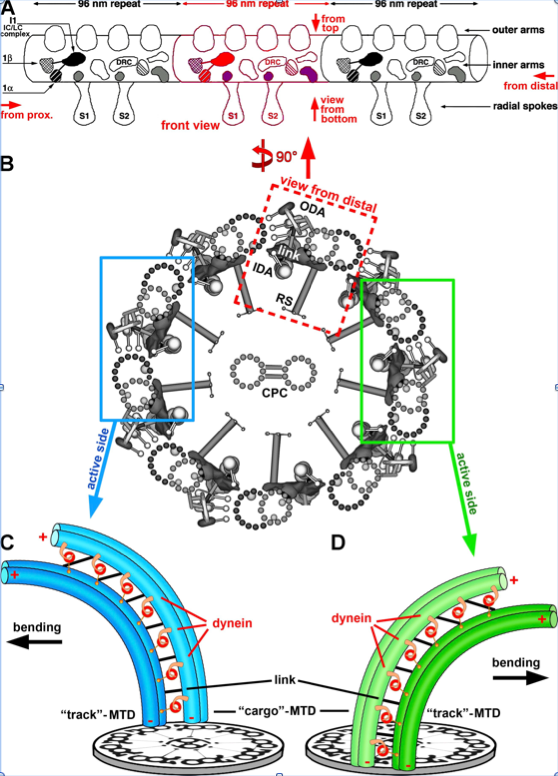 Virtually all motile cilia and flagella share the same microtubule-based core structure, the axoneme, composed of nine doublet microtubules (DMTs) surrounding a central pair of singlet microtubules known as the central pair complex (CPC) (Fig. 1). Structurally, each DMT is built from many copies of a 96 nm-long unit that repeats along the longitudinal DMT axis (Fig. 1A). The proper assembly and function of the components of these repeat units are necessary for the generation of the characteristic wave form of ciliary and flagellar movement. Mutations in these components have been linked to various human diseases termed ciliopathies. 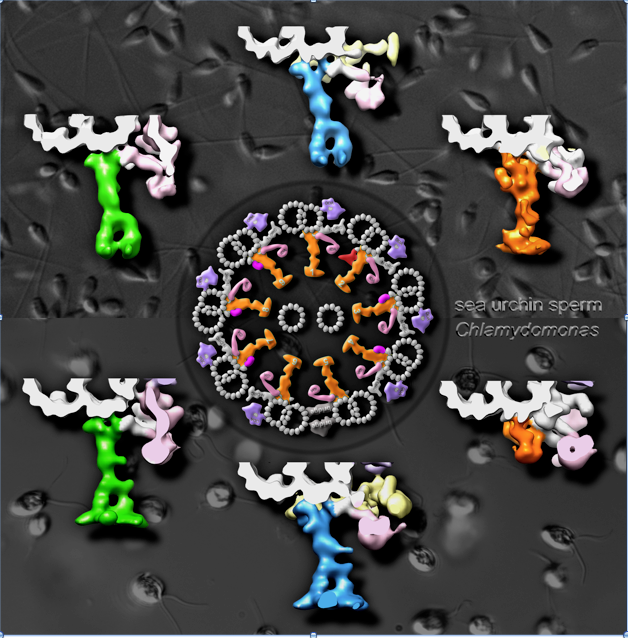 ”] Important components of the 96 nm repeat unit include the dyneins – molecular motors that convert chemical energy into motion – and complexes that regulate dynein activity, such as radial spokes (RSs) and the Nexin-Dynein Regulatory Complex (N-DRC). The dyneins are arranged in two rows: the inner-dynein arms (IDAs) and the outer-dynein arms (ODAs) (Fig. 1B). All dynein motors are permanently anchored on one DMT and generate force by walking along the neighboring DMT, causing both DMTs to slide against one another. Connections between neighboring DMTs, e.g.the nexin links, restrict this sliding motion between DMTs and transform it into the bending motion typical of cilia and flagella. Dynein motors can only move in one direction: towards the minus end of the DMT. Consequently, dyneins on one side of the axoneme cause the axoneme to bend in one direction, whereas dyneins on the opposite side of the axoneme cause it to bend in the opposite direction (Fig. 1B). To generate the characteristic flagellar beating patterns, only subsets of dyneins must be active at any given time. If the dyneins were all active at once, this would put the cilia and flagella in a rigor-like state, as opposite sides of the axoneme would be trying to bend in opposing directions. Precise regulation of dyneins present on subsets of DMTs is thus required to achieve a normal beating pattern. The current model for how cilia and flagella achieve such regulation is that the dyneins receive chemical and mechanical cues from the CPC, through the RSs, to the IDAs or through the N-DRC and the I1-dynein complex to the ODAs. The RSs are key players in this signaling pathway that regulates motility. Previously, classical electron microscopy studies have described RSs as T-shaped structures that are present either as pairs (termed RS1 and RS2; e.g. in Chlamydomonas) or triplets (termed RS1, RS2, and RS3; e.g. in mammalian cilia, sea urchin flagella, and Tetrahymena). It was thought that RSs within pairs or triplets were all structurally identical. Recently, however, the Nicastro group and collaborator Elizabeth Smith’s lab at Dartmouth University demonstrated that RS1 and RS2 (green and blue in Fig. 2 bottom) of the RS pair in Chlamydomonas exhibit heterogeneity, i.e. their docking to the DMT and the structure of their bases are different, suggesting different roles in motility regulation (Barber et al., 2012; Dymek et al. 2011). The Nicastro lab at Brandeis University aims at understanding the structure and function of cilia and flagella. 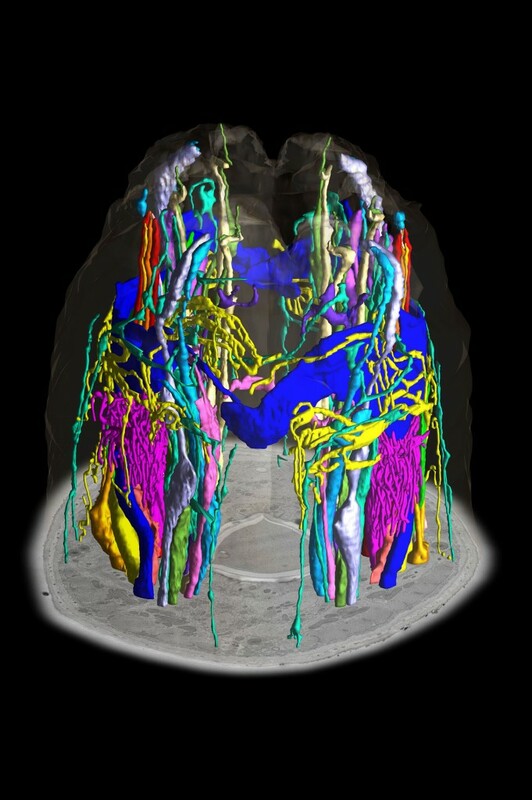 Using state-of-the-art structural methods, such as cryo-electron tomography and sub-tomogram averaging, the Nicastro lab is visualizing the axonemes of different model organisms such as protists (e.g. the bi-flagellated alga Chlamydomonas or the ciliate Tetrahymena with thousands of cilia) and metazoa (e.g. 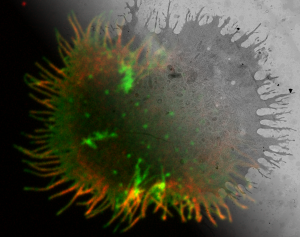 sea urchin sperm flagella) at unprecedented detail (Nicastro et al. 2006; Heuser et al. 2009). In a new study, Dr. Jianfeng Lin (a post-doc in the Nicastro lab) and his colleagues from the Nicastro lab have revealed a remarkably distinct RS heterogeneity that is highly conserved across species (Fig. 2) (Lin et al., 2012). At a resolution of 3.6 nm, it became obvious that RS3 (orange in Fig. 2 top) is structurally unique; bearing no resemblance to RS1 and RS2 (green and blue in Fig. 2 top). In comparison to RS1 & 2, RS3 is larger in mass, and has a bulkier and irregular shape, including the RS head, which consists of two rotationally symmetric halves in RS1 & 2, but is asymmetric in RS3 (Fig. 2 top). Figure 2 (left): Top) Isosurface renderings of RS1 (green), RS2 (blue) and RS3 (orange) in sea urchin sperm flagella. Center) Cross section model of a sea urchin sperm flagellum displaying doublet specific features of the RSs. Bottom) Isosurface renderings of RS1 (green), RS2 (blue) and RS3S (orange) in Chlamydomonas flagella. Perhaps the most intriguing structural difference observed was that RS3 exhibits features which are specific to only some of the nine DMTs, so called doublet-specific features (Fig. 2 center). For example, a structure termed the Radial Spoke Joist (RSJ) is only present on DMTs 3, 4, and 7-9 (magenta in Fig. 2 center). These features seem to act as a triad that connects three major regularory complexes, RS2, RS3, and the N-DRC. The doublet-specific features observed on RS3 suggest that RS3 plays a unique and currently unknown role in generating typical cilia and flagella beating patterns in sea urchin flagella and Tetrahymena cilia. Although the Chlamydomonas axoneme contains only RS pairs, it does possess a structure that occupies the same site in each axonemal repeat that a third RS would occupy in organisms with RS triplets (orange in Fig. 2 bottom). This structure was termed the RS3-stand in (RS3S) by Barber et al. (2012). A comparison of the Chlamydomonas RS3S to RS3 in RS triplets revealed that the basal region of RS3 and the entire RS3S are virtually identical in structure (Fig. 2), suggesting that the RS3S is a shorter homolog of RS3 (Lin et al., 2012). Although past proteomic studies identified the protein composition of the Chlamydomonas RS pair, i.e. of RS1 & 2, the new data suggest that the proteome of RS3 has yet to be determined. RS3 may play a novel role in regulating ciliary and flagellar motility and determining its protein composition in future studies should provide valuable clues to its function. Reference: Nicastro et al. (2006) Science 313: 944-8; Heuser et al. (2009) J Cell Biol 187: 921-33; Dymek et al. (2011) Mol Biol Cell 22: 2520-31; Barber et al. (2012) Mol Biol Cell 23: 111-20; Lin et al. (2012) Cytoskeleton [Epub ahead of print].